A city as old as Newark becomes a repository of many place names some familiar and some astonishingly strange to the ear. Sunfish Pond, Silver Lake, Bathgate's Woods, Boiling Springs, Fox Island, Murphy's Lane, Dark Woods, Goat Hill, Magnolia Swamp, Goose Pastures and Jackson's Land have all but disappeared from our present-day lexicon of local names. But others, such as the Ironbound, Weequahic, Vailsburg, Clinton Hill, and the old Third Ward are known to many of us. We will visit them in the next few weeks. Let's start our journey through our Newark gazetteer of names by looking first at the Ironbound. Like most local names, we cannot point to a person and say he or she coined the name Ironbound. It seems to have evolved over the years as Newark developed from an agricultural village into an industrial and commercial center. Originally, the section was referred to as Dutch Neck and later Down Neck. The latter is still in use today.By the 1830s, with the coming of the railroads and the tracks that surrounded the area, the name Ironbound gradually evolved. While some have suggested the origin of the Ironbound name might be due to 19th century forges and steel fabrication plants, stronger evidence points to the presence of the railroad tracks bounding the area as the factor contributing to the name's origin. 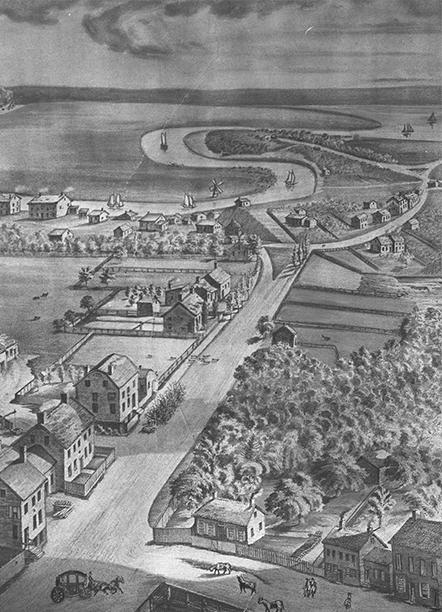 During Newark's earliest history, most of the Ironbound was either swamp or farmland. Indeed, it was here Old First's Col. Josiah Ogden gathered the saltmarsh hay in the incident that led to the founding of Trinity Church. When the Revolutionary War erupted, there were less than a half-dozen homesteads in the area. By 1808, Newark's well-known 'Shoemaker Map' showed little change, with only a handful of families living south of Mulberry Street. They included the Thompsons, Penningtons, Baldwins, Staples, Curtises, Freemans, Kitchells and Bruens. In addition to the New York road, Dung Yard Lane and the Egg Dock on the Passaic River had emerged as new landmarks. By the 1830s, great changes were occurring. Previously, time seemed to stand still. With the incorporation of Newark as a city in 1836, completion of the Morris Canal in 1829 and construction of several railway lines tying Newark to the outside world, dramatic changes were on the horizon, both in Newark and the surrounding area. As the Industrial Revolution began to remake America, Newark was on the front line. Events in Europe brought the first massive wave of immigrants from Ireland as a result of the Great Potato Famine. Unrest in the German states accelerated the German exodus to Newark. Overnight, whole sections of the Ironbound became Irish and German. Names such as Murphy and Burke and Hamburg and Weidenmayer became as common as Pennington and Bruen had been earlier. Some considered the years from 1840 to 1890 the area’s Golden Age. Not only were the railroads surrounding and serving the area, steamboats were beginning to supplement schooners and sloops on the Passaic. Daily, Stephens and Condict operated steamboat service to New York City. Between 1837 to 1839 whaling ships also sailed from city docks, returning with thousands of barrels of precious whale oil. Soon houses, factories, foundries, shops, churches, schools and all manner of buildings were occupying sites that had been farms, orchards and open spaces. Newark's Ironbound section would never be the same. The Ironbound's second great wave of immigration occurred with the influx of southern Europeans headed by the Italians. This community tended to settle along the Passaic River, south of Pennsylvania Station and east to Hoyt Street. The old Dutch church at Ferry and McWhorter streets became Our Lady of Mt. Carmel. By 1902, Sister Frances Xavier Cabrini, the first canonized American saint, founded a school in the area. By 1914, both Portuguese and Spanish immigration had become prominent in the area, especially along Market, Monroe and Wilson. Vasco Jardim published Luso-Americano in Portuguese, and the Portuguese Sport Club was on its way to becoming an important Newark landmark. Polish immigration had begun in 1889. St. Casimir's Polish Roman Catholic Church, first on Tyler Street, subsequently built a new great basilica-type structure on Pulaski Street. Paralleling Polish growth, Newark's Lithuanian community began migration to the city, centered at Holy Trinity Lithuanian Church. In the 1930s, with the construction of the present Pennsylvania Station, a substantial African-American community started to emerge near the construction site. The labor that came to build the station stayed and formed the nucleus of today's community.